Simone wrote to us about her family in Box and the roller-coaster of the lives of the Brunt and Garland families. It was a familiar story to many households in twentieth century Box, with the trauma of two World Wars and the economic deprivation that ensued. Simone and Genevieve's story is different, however, because of the way their family overcame adversity through dance, music and amateur theatrical shows. In some respects British Society after the Second World War has been an attempt to forget the troubled times of a century of war. Simone's initial letter gave brief details about the family's Box roots: my mum is Genevieve Horne (nee Brunt) and both her parents, Stanley Brunt and Mildred Garland, grew up in Box. I know that Mildred's father, Edwin Garland, was head gardener at Box House when the Shaw Mellors were there. My mum was born in Box in 1944 and had an older sister and brother, both born in Box in the 1930s. My aunty Edwina Brunt was a dancer and the whole family were very involved in village life especially the Women's Institute and pantos. We are keen to record more about the family story. The Garland family were originally agricultural workers. James and Caroline Garland lived all of their lives in the beautiful, thatched village of Kingsdon, South Somerset. At Middle Street they brought up at least eight children, four boys and four girls, including Edwin Thomas Garland, Genevieve's grandfather. Probably they worked for the Jenner family at Lytes Carey Manor Farm, now a National Trust property, and their eldest son, John, worked as a domestic groom in service there in 1881. By 1901 many of the children had left home and established their own families. Genevieve's maternal grandfather, Edwin Thomas Garland, was living at Lower Lodge, Corston, Keynsham, Somerset with his wife, Kate Hobbs. Edwin was a gardener from his early years and in 1903 he was specially praised for his arrangement of vases of red and white flowers and arum lilies about the chancel of Corston's church for the Harvest Festival service. He and his wife Kate moved to Box about 1905 living at Springfield, close to Box House where Edwin was working as a gardener. When he joined up for service in the First World War in 1918 Edwin Thomas Garland was 48 years 3 months old in poor health. His army medical report classified him as B2 (not to be placed in category B1 at any time). This meant only able to walk 5 miles (not march) and was just above the category for persons suitable only for sedentary work. He had various complaints, scarring from an infection on his chest, history of bleeding, broken ribs 18 months ago with neurologic pains. He joined the 13th Somerset Light Infantry at Trowbridge and was transferred to the Worcester Regiment, serving in the forces in Ireland in the crackdown after the 1916 Easter Rising for sixteen months until his discharge on 31 March 1920. After his discharge Edwin returned to his job at Box House and became Head Gardener for the Shaw Mellors after they moved there in 1922 from Cranleigh, Surrey. Edwin and Kate lived most of their married life at Springfield, Church Lane. Their house was the middle of three small properties, once the home of the schoolmasters who taught at the Charity School on the top floor of Box workhouse (now Springfield Flats). It was a sheltered life; they were next to Box Church which was the centre of their belief and the focus of their leisure time and Edwin worked in the adjoining property of Box House. On the left-hand side of their home lived Emmy Phelps and on the right the Hinton family, both highly respected village families. In August 1976 Leslie Hinton recorded how he had rung the bells of Box Church over 50 years earlier, following the lead of his father George. They had two children: Reginald Edwin (born in 1897) and Mildred Ethel (born in 1905), my grandmother. Reginald had suffered health issues since he was a toddler. He had fallen into a pond at Corston (probably trying to feed the ducks) when he was about three and suffered severe brain damage. It affected him throughout his life and, in the terminology of 1918, he was described by the unfortunate word imbecile. Mildred was a responsible and mature young lady. In about 1922 the Box Church Girls' Guild were keen to build a club room. They put on a presentation of an Eastern costume drama. It was a series of tableaux about Kings in Babylon interspersed with narrative although the plot was at times a little mystifying. The prompter was rarely called upon although scenic troubles were naturally abundant. All the time she was working as a self-employed milliner making children's hats. The family's life was interrupted when Edwin died unexpectedly of angina pectoris (heart attack) on 2 May 1932, aged 66 years. His obituary in the newspaper recorded his great interest in the life of the village. He had been a sidesman in the church, a member of Box Parochial Church Council and a well known resident in the village. Springfield Cottage was a tied house (subject to his continuing employment at Box House) and Kate had to leave, moving in with her son-in-law and daughter at Valens Terrace. On Edwin's death, there was no accommodation suitable for Reginald, who was admitted to St George's Hospital, Semington. He lived there in good physical health for a further 27 years until, out for a walk in 1960, he was hit by a lorry and tragically killed. The paternal side of my ancestors had a similar story in Victorian times. The first relative that I have found of my paternal family was William Brunt, born in 1808, shortly after Napoleon was appointed Emperor in France. He married Isabella Derrick and worked as an agricultural labourer. In 1851 they lived at Street End, Blagdon, Axbridge with their three sons and Isabella's mother, Mary (born 1775), a Pauper labourer's widow. The eldest son, John Brunt, born in 1844 at Blagdon, Somerset, married another local girl Francis, sometimes called Fanny. 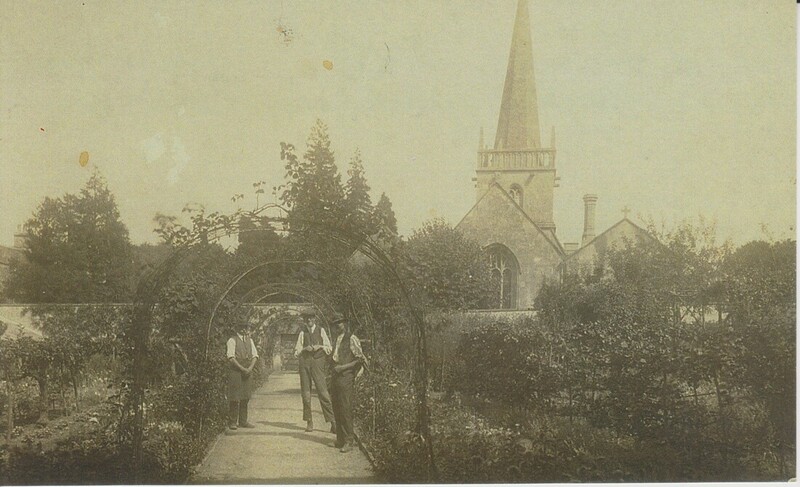 John did not go into farming, instead becoming a policeman serving at Clifton, Bristol about 1872, in Beckington, Frome in 1881, at Bathford in 1891, and Weston, Bath in 1901. He returned as a police pensioner with Fanny to Blagdon in 1911. They had at least seven sons, the last of whom was Percy Brunt born in 1882, who worked on the railways for eleven years, a station foreman for Bath's London, Midland and Scottish Railway passenger station. In his younger days Percy was a formidable cricketer appearing several times at Lord's, London. He died at Bath, aged 57 in March 1939. I mention his career because later generations seem to have the same character. 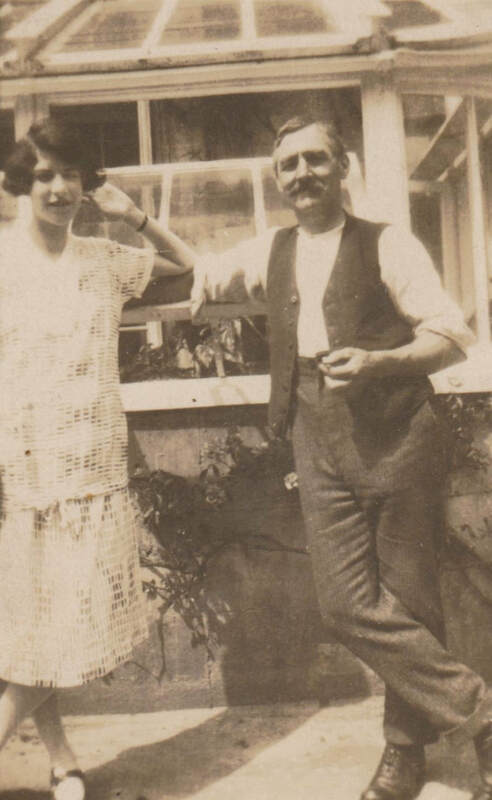 My great grandfather, Ernest Brunt, was born in Bristol in 1875, the fourth child of John and Fanny. At the age of 16 years in 1891 he was working at Bathampton Farm, Somerset, as the only male servant of William Shackell, a dairy farmer. Ernest continued to work on farms as an agricultural labourer. He married Emily Kate Clements in Bath in 1898 and they moved around from farm to farm with their three sons, Percy Reginald, Ernest Victor and Stanley James, all born at Bathford. By 1918 the whole family had moved to The Cottage, Ben Mead, Box. Their oldest child, Percy Reginald J Brunt, was my great uncle. Percy was born at Bathford on 28 March 1900. Percy joined the Royal Army Ordnance Corps in April 1918 aged eighteen years when he was a gardener living at home with his parents at Ben Mead. He served as a Private with the British Army on the Rhine after the armistice of November 1918, dealing with the settlement of areas after the Treaty of Versailles in June 1919. He was a crack rifle shot scoring 96 out of 100 and was accepted to extend his service for a year in February 1920. Then disaster struck. In August 1920 Percy was arrested in Cologne for stealing 10½ pairs of socks and a brassard (armband) and having two fraudulent passes. He was found guilty, sentenced to 90 days imprisonment and discharged for misconduct. He earned 14 days remission for good behaviour. In 1929 Percy was registered on his own as an elector lodging at 5 Fairview, Twerton, Bath. By 1930 he was living with his wife Elizabeth Kate at 12 Lyme Road, Weston, Bath in 1930. At the age of 17 Victor, as he was known, had volunteered to serve in the army as a British Red Cross orderly whilst living with his mother at Middlehill. Because of his age he was restricted to 400 hours as a part-time worker. In 1935 he married Nancy Elizabeth Wheeler of Townsend Villa and they had a daughter Diane Nancy. Victor worked for Miss Marjorie Bailey of Heleigh House for a number of years and on her death in 1939 she left him her dog Robin. Percy's younger brother, Stanley Brunt, was my grandfather. He followed several of the family traditions, a part-time stationmaster at Mill Lane Halt and the groundsman for Box Cricket Club on the Rec. But neither of those roles was his main job in 1939 when Stanley was recorded as working for the Calne and Chippenham Rural District Council as a Rent Collector and Meter Reader. ​2 Valens Terrace and the story of their time there is given in the next issue of the website. Stanley was a stalwart of St Thomas à Becket Church in Box. He assisted with the Parochial Church Dance on Boxing Day 1936 at the Bingham Hall, attended by 200 villagers. He chimed the bells at the church for the marriage of Henry Bert Smith and Miss Norah Emily Pictor in May 1940, most unusual at that time and just before the sounding of bells was banned in England in June except for air raids. After the war he worked in the Box Telephone Exchange, which was a brick-built outhouse in the garden of the Post Office, with a large switchboard, an old-fashioned fireplace and a chaise longue. Above all, he was renowned as a fast bowler in Box Cricket Club for very many years. In 1933 he was presented with an award by Club President Mr A Shaw-Mellor for his successful bowling. He was still playing in 1949, aged 46 years, when he was vice captain of the Second Eleven. Above Left: Box Cricket Club in mid or late 1930s: Standing: Umpire, Jack Gee, Jack Tottle, Ben Vezey, unknown, unknown, Bill Guy, Mr Peplar (umpire). Seated: unknown, unknown, Stanley Brunt, unknown; Squatting: unknown, Alec Cogswell. In the summer of 2018, Simone and Genevieve came to visit Box and Genevieve led us around the places she remembered from her childhood here. She tells us more about those times in later issues, together with more wonderful photographs. In the next issue we pick up the story of Mildred's life and the theatrical events that she and Stanley put on in Box. Edwin Thomas Garland (b 1870) married Kate Hobbs (b 12 September 1876 at Henbury, Gloucestershire) on 2 September 1896 at Wickwar, Gloucestershire. In 1901 they lived at Lower Lodge, Corston, Keynsham. ​(b 1846 at Blagdon); and Joseph (b 1849 at Blagdon). Frank (b 1869 at Blagdon), a groom in domestic service; Sidney (b 1871); Gilbert (b 1873 at Clifton); Ernest (b 1875 at Clifton); Charles (b 1877 at Clifton), an agricultural labourer; Joseph (b 1880 at Beckington), a general labourer; and Percy (b 1882 at Beckington), policeman. Stanley James (1903 - 1964). 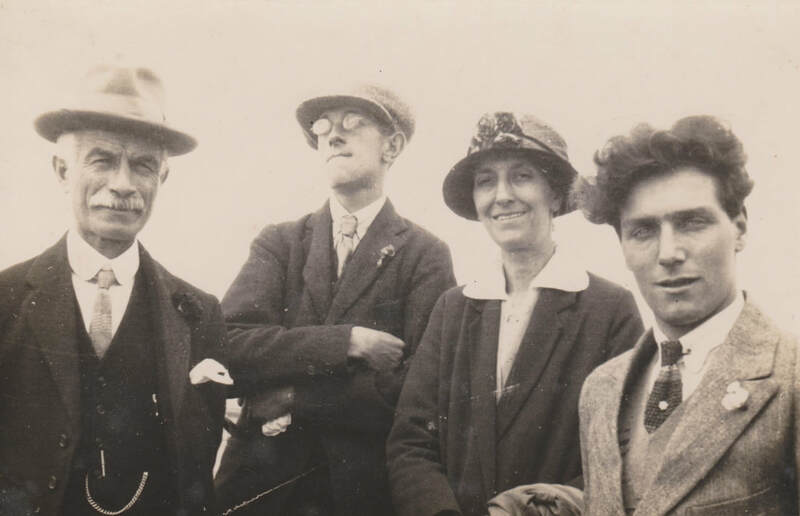 Stanley James Brunt was born on 9 September 1903 in Bathford and he died in 1964 at Bath.